The MCM offers a variety of technology services for runners and spectators to use before, during and after MCM Weekend. From the MCM App to Track a Runner services to Motigo, the MCM community is able to interact, investigate, inform and inspire, often requiring just a swipe or click. The best way to connect with the MCM remains over social media. Join the community on Facebook and Twitter and follow behind-the-scenes on Instagram. The MCM App is available for both iPhone and Android platforms. The app offers easy access to all essential MCM Weekend information including maps, spectator tips, schedules, transportation, photos, videos, weather forecast, runner tracking service, social media feeds and live results. The MCM offers tolls to receive updates on runner's movement along the course by receiving a timely text or email in realtime. Sign up soon to follow individual or multiple runners on their journey to the Marine Corps War Memorial. Motigo will transform the 43rd Marine Corps Marathon into a personalized running experience! Download the MCM App listen to it during the run to hear a course specific audio tour with periodic pre-recorded messages highlighting the course. Best feature - Invite friends and family to pre-record cheers! 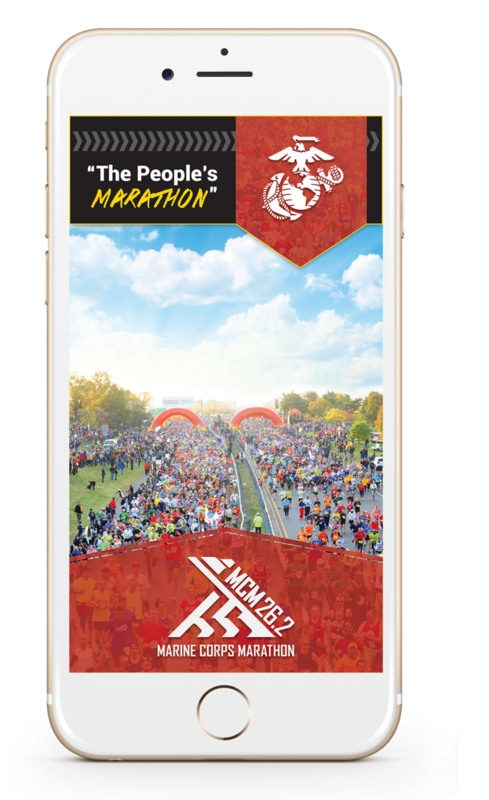 Download the app and search for the Marine Corps Marathon to get started! Available for iOS and Android. Learn more at www.getmotigo.com. Invite family and friends to cheer, just download the app, select the MCM event, then select “Share Event” and invite your supporters to record cheers and remember to “Start Event” the morning of your run. The MCM website will host live results throughout the day at www.marinemarathon.com. The MCM and WTOP want to hear your story of running with purpose and finishing with pride. What motivated you to #RunWithTheMarines? What is your personal inspiration for registering for “The People’s Marathon?” What makes your MCM participation different? Share your story, as it could be just the thing to inspire someone else. Some stories may be featured on WTOP or on the MCM website.